For British Stamps, 1882 started out with an onslaught of high denomination definitive postage stamps. The four stamps issued in 1882, which come in both White Paper and Blued Paper varieties, are among the most elusive rarities of all British philately. During 1882, a new very-large-format 5 Five Pound definitive stamp was issued, and the three large-format high denomination definitive stamps of 1867-1878 were re-issued. They are all exquisitely typographed and printed on paper with WMK 31 -- the Large Anchor watermark. The 5 £ denomination has two Large Anchor watermarks. 5 S. (1882 - Plate 4 - Scott #90) - Rose on White Paper, Rose on Bluish Paper. 10 S. (1882 - Plate 1 - Scott #91) - Slate on White Paper, Slate on Bluish Paper. 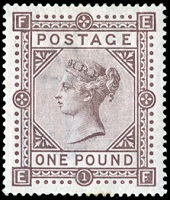 1 £ (1882 - Plate 1 - Scott #92) - Brown Lilac on White Paper, Brown Lilac on Bluish Paper. 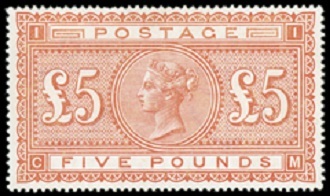 5 £ (1882 - Plate 1 - Scott #93) - Bright Orange on White Paper, Dull Orange on Deeply Blued Paper, Bright Orange on Bluish Paper. The Bluish Paper varieties are the more expensive of the paper varieties. The 5 £ denomination actually started out as a telegraph stamp. The word "TELEGRAPH" was erased from the top of the plate impressions and replaced with the word "POSTAGE". Though these high denomination British stamps were valid for postal fees, many of them were actually used and canceled on telegraph receipts. 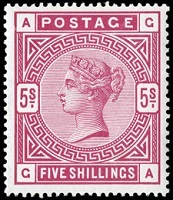 In 1883, types of the 3 P. and 6 P. denominations in un-issued colors were surcharged "3d" and "6d" in carmine ink (Scott #94-95). They are both shown above. These stamps were produced on paper with WMK 30 -- the Imperial Crown watermark. The 1/2 P. denomination and the "lilac" and "green" denominations shown above were issued in 1883 and 1884. They were also printed on paper with WMK 30 -- the Imperial Crown watermark. 1/2 P. (1884 - Scott #98) - Slate Blue. 1 1/2 P. (1884 - Scott #99) - Lilac. 2 P. (1884 - Scott #100) - Lilac. 2 1/2 P. (1884 - Scott #101) - Lilac. 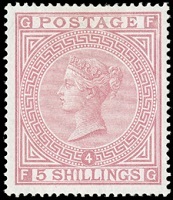 3 P. (1884 - Scott #102) - Lilac. 4 P. (1884 - Scott #103) - Green. 5 P. (1884 - Scott #104) - Green. 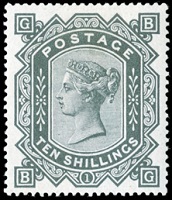 6 P. (1884 - Scott #105) - Green. 9 P. (1883 - Scott #106) - Green. 1 S. (1884 - Scott #107) - Green. The 1 P. denomination, issued in 1881, continued in use during this period. To prevent the soaking and re-use of un-canceled stamps, the lilac and green denominations of this series were printed using "fugitive inks". When these stamps are improperly soaked, the inks used to print them, either run or change color. The images shown above, illustrate the "original colors" in which these stamps were printed. Unfortunately, many faded and / or discolored examples of these British stamps are frequently sold to unsuspecting collectors. These "damaged" stamps are worth only a fraction of the prices listed for the stamps in their original colors. Between 1883 and 1884, a new 2 S. 6 P. denomination was introduced, and the 5 S. and 10 S. denominations were re-designed. These new large-format high denomination definitive stamps replaced those issued between 1867 and 1882. These stamps were all printed on paper with WMK 31 -- the Large Anchor watermark. 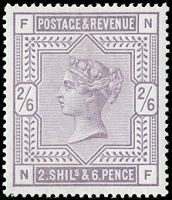 2 S. 6 P. (1883 - Scott #96) - Lilac on White Paper, Lilac on Bluish Paper (Rare - Illustrated Above). 5 S. (1882 - Plate 4 - Scott #90) - Carmine Rose on White Paper (Illustrated Above), Carmine Rose on Bluish Paper (Rare), Deep Crimson on White Paper. 10 S. (1882 - Plate 1 - Scott #91) - Ultramarine on White Paper (Illustrated Above), Ultramarine on Bluish Paper (Rare), Cobalt on White Paper (Rare), Cobalt on Bluish Paper (Rare). In 1884, a new wider-format 1 £ definitive postage stamp was introduced. This new stamp was printed on white paper with WMK 30 -- the Imperial Crown watermark. There are three watermarks, horizontally, on each stamp. In 1888, the same stamp was printed on white paper with WMK 29 -- the Orb watermark. There are three watermarks, horizontally, on these stamps, as well. 1 £ (1884 - Crown Wmk. - Scott #110) - Brown Violet. 1 £ (1888 - Orb Wmk. - Scott #123) - Brown Violet. The brand new series of definitive postage British stamps shown above, as well as the 1 £ issue of 1884 in a new color, were issued beginning in 1887 and continuing through 1900. These stamps are all printed on paper with WMK 30 - the Imperial Crown watermark. This definitive series is referred to as the "Queen Victoria Jubilee Issue", as they were issued during the time of the Golden Jubilee of the Reign of Queen Victoria. Something to remember .... some of the denominations of this series of British stamps were also printed with fugitive inks. Any examples that are either faded or discolored should be avoided. 1/2 P. (1887 - Scott #111) - Vermilion. 1/2 P. (1900 - Scott #125) - Blue Green. 1 1/2 P. (1887 - Scott #112) - Violet and Green. 2 P. (1887 - Scott #113) - Green and Carmine Rose, Green and Vermilion. 2 1/2 P. (1887 - Scott #114) - Violet on Blue. 3 P. (1887 - Scott #115) - Violet on Yellow, Violet on Orange. 4 P. (1887 - Scott #116) - Brown and Green. 4 1/2 P. (1892 - Scott #117) - Carmine Rose and Green. 5 P. (1887 -Type I - Scott #118a) - Lilac and Blue. 5 P. (1887 -Type II - Scott #118) - Lilac and Blue. 6 P. (1887 - Scott #119) - Violet on Rose. 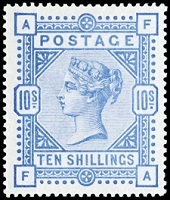 9 P. (1887 - Scott #120) - Blue and Lilac. 10 P. (1890 - Scott #121) - Carmine Rose and Lilac, Scarlet and Lilac, Deep Carmine Rose and Red Lilac. 1 S. (1887 - Scott #122) - Green. 1 S. (1900 - Scott #126) - Carmine Rose and Green. 1 £ (1891 - Scott #124) - Green.